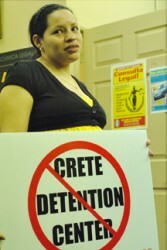 Immigrant families and supporters announced a three day walk to Crete to contest the creation of the Crete Immigration Detention Center. During a press conference at Our Lady of Guadalupe Mission, 3442 W. 26th St., immigrant families, activists, and supporters stated they will embark on a three day walk from Little Village to Crete. The action is a response to the detention center planned by Immigration and Custom Enforcement (ICE), Corrections Corporation of America (CCA) and the village of Crete. The three day walk will commence on March 30 at Our Lady of Guadalupe Mission and will end on April 1st. ICE is negotiating with the village of Crete and Corrections Corporation of America to build a new Immigrant Detention Center, a prison with the capacity to incarcerate 700-800 immigrants, just South of Chicago. The contract has not yet been signed – and until it is, this new prison can still be stopped. ICE is currently planning to build at least five detention centers nationwide located in states that have a high concentration of immigrants, California, Texas, Illinois, Florida, and New Jersey.